GREAT NEWS! You may have seen the recent review and giveaway that I posted for a fantastic cookbook called Best of the Best from the Deep South. The memories that were posted were just so heartwarming that I think this has been my favorite giveaway yet! If you love the types of recipes I have over at Deep South Dish, then this is definitely the cookbook for you! Well... 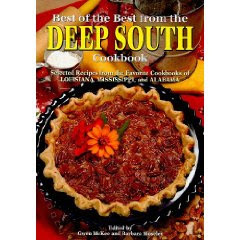 I just heard from the publisher, and they are offering a special discount to any of my readers who would like to purchase the Best of the Best from the Deep South cookbook. Place a telephone order by calling 1-800-343-1583, and mention that you are a friend of Deep South Dish/My New 30, and you will receive 20% DISCOUNT! The discount is only available with phone orders, and I'm sure it will only be available for a limited time, so be sure to call soon if you'd like to add this cookbook to your collection! I just love a sale! Oh how cool is that! Thanks for the discount offer Mary. I can see why it was your favorite. That looks like a great recipe book.